The list of officially confirmed songs for The Beatles: Rock band grows to twenty-five this morning, as today's trailer reveals are joined by seven more tracks by way of official EA decree. It's been a busy morning for The Beatles: Rock Band. 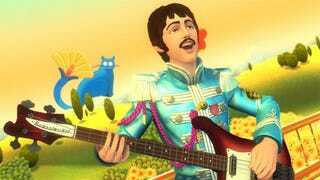 First the trailer dropped, bringing with it eight new songs, from "Paperback Writer" to "Revolution". Now EA has released a list of fifteen new tracks, eight of which were included in the video, and three - "Do You Want To Know A Secret," "I Wanna Be Your Man," and "And Your Bird Can Sing" - mentioned in McWhertor's preview. So what songs does that leave us with? How about "With A Little Help From My Friends," "Birthday," "I Got a Feeling," and "Dig a Pony?" Are those good enough for you? No? There's just no pleasing some people.